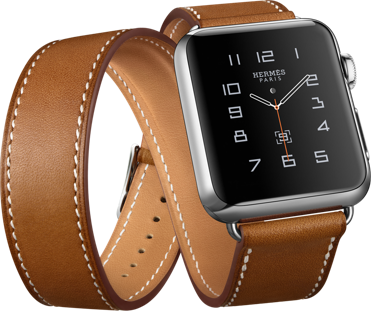 Apple just announced that it’s stylish Hermes watch is now available online. New Zealand, unfortunately, lacks a local physical Apple store. The nearest Apple store for Kiwis is Sydney. The good news is that you now can purchase Hermes watch from Apple’s online store or mobile app as of yesterday. The NZ online store still doesn’t offer online purchases for some reason. Hermes is a high-end fashionable wristwatch. Apple and Hermes joined forces to blend the best of tech with the best of fashion. Hermes has designed the leather straps. The straps are apparently handmade by artisans in France, which explains the pricing. The Apple Hermes leather band is offered as Double tour and Single tour. The Double tour band wraps twice around the wrist. It comes in four colours that fashion aware consumers will recognise: Etain, Capucine, Jean Bleu and Fauve. The Single tour band wraps once like most watches and is available in Fauve, Noir and Capucine colours. The heart rate sensor stays in touch with the skin. There are two case sizes: 38 mm and 42 mm. The larger case size is only available for the Single Tour band. It’s not a cheap watch to buy, but that’s not the purpose. The prices for the Apple Hermes watch start from AU$1,700 (about NZ$1,830) for the Single tour with a 38 mm case. The Double tour costs AU1,950 (about NZ$2,100). There are other Apple watches with more reasonable price tags if you find the Hermes watch too expensive.